It is not true that Lenin's slogan: "To come to an agreement with the middle peasant, while never for a moment renouncing the fight against the kulak, and firmly relying solely on the poor peasant," which he advanced in his well-known article on Pitirim Sorokin, is, as is alleged, a slogan of the "period of the Poor Peasants' Committees," a slogan of "the end of the period of the so-called neutralisation of the middle peasantry." That is absolutely untrue. The Poor Peasants' Committees were formed in June 1918. By the end of October 1918, our forces in the countryside had already gained the upper hand over the kulaks, and the middle peasants had turned to the side of the Soviet power. It was on the basis of this turn that the decision of the Central Committee was taken to abolish the dual power of the Soviets and the Poor Peasants' Committees, to hold new elections to the volost and village Soviets, to merge the Poor Peasants' Committees with the newly-elected Soviets and, consequently, to dissolve the Poor Peasants' Committees. This decision was formally approved, as is well known, on November 9, 1918, by the Sixth Congress of Soviets. I have in mind the decision of the Sixth Congress of Soviets of November 9, 1918, on the village and volost Soviet elections and the merging of the Poor Peasants' Committees with the Soviets. But when did Lenin's article, "The Valuable Admissions of Pitirim Sorokin," appear, the article in which he proclaimed the slogan of agreement with the middle peasant in the place of the slogan of neutralising the middle peasant? It appeared on November 21, 1918, i.e., nearly two weeks after the decision of the Sixth Congress of Soviets. In this article Lenin plainly says that the policy of agreement with the middle peasant is dictated by the turn to our side made by the middle peasant. "Our task in the countryside is to destroy the landlord and smash the resistance of the exploiter and the kulak speculator. For this purpose we can rely firmly only on the semi-proletarians, the 'poor peasants.' But the middle peasant is not our enemy. He vacillated, is vacillating and will continue to vacillate. The task of influencing the vacillators is not identical with the task of overthrowing the exploiter and defeating the active enemy. The task at the present moment is to come to an agreement with the middle peasant, while never for a moment renouncing the fight against the kulak, and firmly relying solely on the poor peasant, for it is precisely now that a turn in our direction on the part of the middle peasantry is inevitable,* owing to the causes above enumerated" (Vol. XXIII, p. 294). It follows from this that Lenin's slogan refers, not to the old period, not to the period of the Poor Peasants' Committees and the neutralisation of the middle peasant,but to the new period, the period of agreement with the middle peasant. Thus, it reflects, not the end of the old period, but the beginning of a new period. But your assertion about Lenin's slogan is not only wrong from the formal point of view, not merely, so to speak, chronologically; it is wrong in substance. "In all its work in the countryside the R.C.P., as hitherto, relies on the proletarian and semi-proletarian strata of the rural population; first and foremost it organises these strata into an independent force by establishing Party units in the villages, forming organisations of poor peasants, a special type of trade unions of proletarians and semi-proletarians in the country side, and so forth, bringing them closer in every way to the urban proletariat and wresting them from the influence of the rural bourgeoisie and the small proprietor interests. "With respect to the kulaks, to the rural bourgeoisie, the policy of the R.C.P. is resolutely to combat their exploiting proclivities, to suppress their resistance to the Soviet policy. Try to find the slightest difference even in words between these points of the programme and Lenin's slogan! You will not find any difference, for there is none. More than that. There cannot be any doubt that Lenin's slogan not only does not contradict the decisions of the Eighth Congress on the middle peasant, but, on the contrary, is a most apt and exact formulation of these decisions. And it is a fact that the programme of the C.P.S.U.(B.) was adopted in March 1919, at the Eighth Congress of the Party, which specially discussed the question of the middle peasant, while Lenin's article against Pitirim Sorokin, which proclaimed the slogan of agreement with the middle peasant, appeared in the press in November 1918, four months before the Eighth Congress of the Party. Is it not clear that the Eighth Congress of the Party fully and entirely confirmed Lenin's slogan, proclaimed by him in his article against Pitirim Sorokin, as a slogan by which the Party must be guided in its work in the countrysideduring the whole of the present period of socialist construction? What is the essential point of Lenin's slogan? 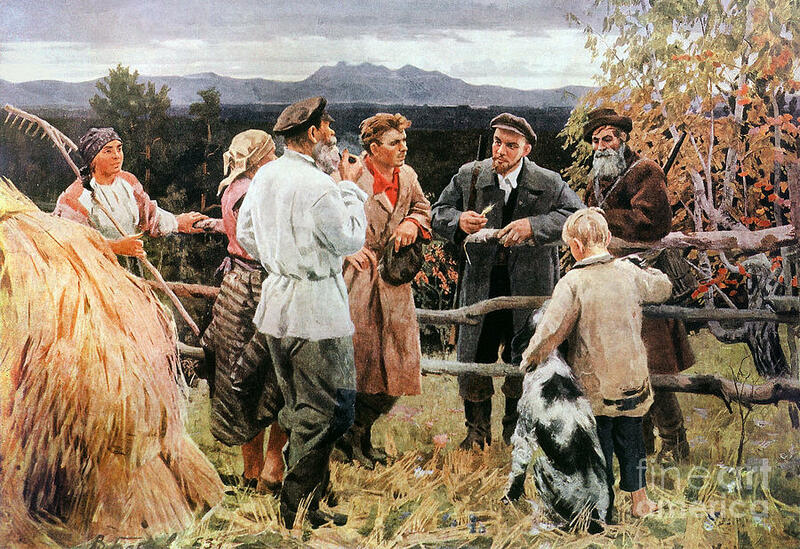 The essential point of Lenin's slogan is that it embraces with remarkable precision the triune task of Party work in the countryside, expressed in a single condensed formula: a) rely on the poor peasant, b) establish agreement with the middle peasant, and c) never for a moment cease fighting against the kulaks. Try to take from this formula any one of its parts as a basis for work in the countryside at the present time and forget about the other parts, and you will inevitably find yourself in a blind alley. Is it possible in the present phase of socialist construction to reach a real and stable agreement with the middle peasant without relying on the poor peasant and without waging a fight against the kulak? Is it possible, under the present conditions of development, to wage a successful fight against the kulak without relying on the poor peasant and without reaching agreement with the middle peasant? How can this triune task of Party work in the countryside be most aptly expressed in one all-embracing slogan? I think that Lenin's slogan is the most apt expression of this task. It must be admitted that you cannot express it more aptly than Lenin. . . .
Why is it necessary to emphasise the expediency of Lenin's slogan just now, precisely under the present conditions of work in the countryside? Because just now we see a tendency among certain comrades to break up this triune task of Party work in the countryside into parts and to sever these parts from one another. This is fully borne out by the experience of our grain-procurement campaign in January and February of this year. Every Bolshevik knows that agreement must be reached with the middle peasant. But not everybody understands how this agreement is to be reached. Some think that agreement with the middle peasant can be brought about by abandoning the fight against the kulak, or by slackening this fight; because, they say, the fight against the kulak may frighten away a section of the middle peasantry, its well-to-do section. Others think that agreement with the middle peasant can be brought about by abandoning the work of organising the poor peasants, or by slackening this work; because, they say, the organisation of the poor peasants means singling out the poor peasants, and this may frighten the middle peasants away from us. "We have to determine our attitude to a class which has no definite and stable position. * The proletariat in its mass is in favour of socialism, the bourgeoisie in its mass is opposed to socialism; to determine the relation between these two classes is easy. But when we pass to a stratum like the middle peasantry we find that it is a class that vacillates. The middle peasant is partly a property owner, partly a toiler. He does not exploit other representatives of the toilers. For decades he had to defend his position under the greatest difficulties; he suffered the exploitation of the landlords and the capitalists; he bore everything and yet at the same time he is a property owner. Our attitude to this vacillating class therefore presents enormous difficulties" (Eighth Congress of the R.C.P.(B. ), verbatim report, p. 300 ). But there are other deviations from the correct line, no less dangerous than those already mentioned. In some cases the fight against the kulak is indeed carried on, but it is carried on in such a clumsy and senseless manner that the blows fall on the middle and poor peasants. As a result, the kulak escapes unscathed, a rift is made in the alliance with the middle peasant, and a section of the poor peasants temporarily falls into the clutches of the kulak, who is fighting to undermine Soviet policy. In other cases attempts are made to transform the fight against the kulaks into dekulakisation, and the work of grain procurement into appropriation of surpluses, forgetting that under present conditions deku-lakisation is folly and the surplus-appropriation system means not an alliance with, but a fight against, the middle peasant. What is the source of these deviations from the Party line? The source lies in failure to understand that the triple task of Party work in the countryside is a single and indivisible task; in failure to understand that the task of fighting the kulak cannot be separated from thetask of reaching agreement with the middle peasant, and that these two tasks cannot be separated from the task of converting the poor peasant into a bulwark of the Party in the countryside. What must be done to ensure that these tasks are not separated from one another in the course of our current work in the countryside? We must, at least, issue a guiding slogan that will combine all these tasks in one general formula and, consequently, prevent these tasks from being separated from one another. Is there such a formula, such a slogan in our Party arsenal? Yes, there is. That formula is Lenin's slogan: "To come to an agreement with the middle peasant, while never for a moment renouncing the fight against the kulak, and firmly rely ing solely on the poor peasant." That is why I think that this slogan is the most expedient and all-embracing slogan, that it must be brought to the forefront just now, precisely under the present conditions of our work in the countryside. You regard Lenin's slogan as an "oppositionist" slogan and in your letter you ask: "How is it that . . . this oppositionist slogan was printed in Pravda for May 1, 1928 . . . how can the fact be explained that this slogan appeared on the pages of Pravda, the organ of the Central Committee of the C.P.S.U.—is this merely a technical oversight, or is it a compromise with the opposition on the question of the middle peasant?" That is very strongly put—there's no denying! But "watch your step," Comrade S.; otherwise you may, in your zeal, arrive at the conclusion that we must prohibit the printing of our programme, which fully confirms Lenin's slogan (this is a fact! ), and which in the main was drawn up by Lenin (who was certainly not an oppositionist! ), and which was adopted by the Eighth Congress of the Party (also not oppositionist!). Have more respect for the well-known points in our programme on the social groups in the countryside! Have more respect for the decisions of the Eighth Party Congress on the middle peasantry! . . .
As for your phrase "a compromise with the opposition on the question of the middle peasant," I do not think it is worth refuting it; no doubt you wrote it in the heat of the moment. You seem to be disturbed by the fact that both Lenin's slogan and the Programme of the C.P.S.U.(B.) adopted by the Eighth Congress of the Party speak of agreement with the middle peasant, whereas in his speech in opening the Eighth Congress Lenin spoke of a stable alliance with the middle peasant. Evidently, you think there is something in the nature of a contradiction in this. Perhaps you are even inclined to believe that the policy of agreement with the middle peasant is something in the nature of a departure from the policy of alliance with the middle peasant. That is wrong, Comrade S. That is a serious misconception. Only those who are able to read the letter of a slogan, but are unable to grasp its meaning, can think like that. Only those who are ignorant of the history of the slogan of alliance, of agreement with the middle peasant, can think like that. Only those can think like that who are capable of believing that Lenin, who in his opening speech at the Eighth Congress spoke about the policy of a "stable alliance" with the middle peasant, departed from his own position by saying in another speech at the same congress, and in the Party programme adopted by the Eighth Congress, that we now need a policy of "agreement" with the middle peasant. What is the point then? The point is that both Lenin and the Party, in the shape of the Eighth Congress, make no distinction whatever between the concept "agreement" and the concept "alliance." The point is that everywhere, in all his speeches at the Eighth Congress, Lenin places a sign of equality between the concept "alliance" and the concept "agreement." The same must be said about the resolution of the Eighth Congress, "The Attitude to the Middle Peasantry," in which a sign of equality is placed between the concept "agreement" and the concept "alliance." And since Lenin and the Party regard the policy of agreement with the middle peasant not as a casual and transient one, but as a long-term policy, they had, and have, every reason to call the policy of agreement with the middle peasant a policy of stable alliance with him and, conversely, to call the policy of stable alliance with the middle peasant a policy of agreement with him. One has only to read the verbatim report of the Eighth Congress of the Party and the resolution of that congress on the middle peasant to be convinced of this. "Owing to the inexperience of Soviet officials and to the difficulties of the problem, the blows which were intended for the kulaks very frequently fell on the middle peasantry. Here we have sinned exceedingly. The experience we have gained in this respect will enable us to do everything to avoid this in the future. That is the task now facing us, not theoretically, but practically. You know very well that this task is a difficult one. We have no material advantages to offer the middle peasant; and he is a materialist, a practical man who demands definite, material advantages, which we are not now in a position to offer and which the country will have to do without, perhaps, for several months yet of severe struggle—a struggle which now promises to end in complete victory. But there is a great deal we can do in our administrative work: we can improve our administrative apparatus and correct a host of abuses. The line of our Party, which has not done enough towards arriving at a bloc, an alliance, an agreement* with the middle peasantry, can and must be straightened out and corrected" (Eighth Congress of the R.C.P.(B. ), verbatim report, p. 20 ). As you see, Lenin makes no distinction between "agreement" and "alliance." "To confuse the middle peasants with the kulaks, to extend to them, to any degree, the measures that are directed against the kulaks, means most grossly to violate, not only all Soviet decrees and all Soviet policy, but also all the fundamental principles of communism, which point to agreement between the proletariat and the middle peasantry during the period of the resolute struggle of the proletariat for the overthrow of the bourgeoisie as one of the conditions for the painless transition to the abolition of all forms of exploitation. "The middle peasantry, which possesses comparatively strong economic roots owing to the backwardness of agricultural technique, compared with industrial technique, even in the advanced capitalist countries, let alone Russia, will continue to exist for a fairly long time after the beginning of the proletarian revolution. That is why the tactics of Soviet officials in the countryside, as well as of active Party workers, must be based on the assumption of a long period of collaboration with the middle peasantry. . . .
". . . An absolutely correct policy pursued by the Soviet government in the countryside thus ensures alliance and agreement between the victorious proletariat and the middle peasantry. . . .
". . . The policy of the workers' and peasants' government and of the Communist Party must continue to be conducted in this spirit of agreement between the proletariat, together with the poor peasantry, and the middle peasantry" (Eighth Congress of the R.C.P.(B. ), verbatim report, pp. 3 7 0-7 2 ). As you see, the resolution also makes no distinction between "agreement" and "alliance." It will not be superfluous to observe that there is not a single word in this resolution of the Eighth Congress about a "stable alliance" with the middle peasant. Does that mean, however, that the resolution thereby departs from the policy of a "stable alliance" with the middle peasant? No, it does not. It only means that the resolution places a sign of equality between the concept "agreement," "collaboration," and the concept "stable alliance." For it is clear: there cannot be an "alliance" with the middle peasant without an "agreement" with him, and the alliance with the middle peasant cannot be "stable" unless there is "a long period" of agreement and collaboration with him. Either one or the other: either Lenin and the Eighth Congress of the Party departed from Lenin's statement about a "stable alliance" with the middle peasant, or this frivolous assumption must be abandoned and it must be admitted that Lenin and the Eighth Congress of the Party made no distinction whatever between the concept "agreement" and the concept "stable alliance." Thus, one who refuses to be a victim of idle pedantry, one who desires to grasp the true meaning of Lenin's slogan, which speaks of relying on the poor peasantry, of agreement with the middle peasantry and of fighting the kulaks, cannot fail to understand that the policy of agreement with the middle peasant is a policy of stable alliance with him. Your mistake is that you have failed to understand the fraudulent trick of the opposition and have fallen a prey to their provocation; you walked into the trap the enemy set for you. 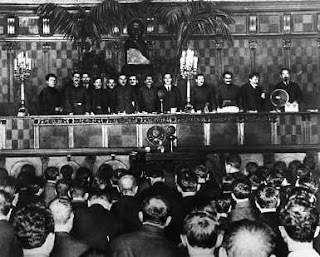 The oppositionist swindlers noisily assure us that they are in favour of Lenin's slogan of agreement with the middle peasant, but at the same time they drop the provocatory hint that "agreement" with the middle peasant is one thing and a "stable alliance" with him is something different. In this way they want to kill two birds with one stone: firstly, to conceal their real attitude to the middle peasantry, which is not one of agreement with the middle peasant, but of "dissension with the middle peasant" (see the well-known speech of the oppositionist Smirnov, which I quoted at the Sixteenth Moscow Gubernia Party Conference ); and, secondly, to catch the simpletons among the Bolsheviks with the alleged difference between "agreement" and "alliance," and muddle them up completely, by driving them away from Lenin. And how do certain of our comrades react to this? Instead of tearing the mask from the oppositionist tricksters, instead of convicting them of deceiving the Party about their true position, they swallow the bait, walk into the trap, and allow themselves to be driven away from Lenin. The opposition is making a lot of noise about Lenin's slogan; the oppositionists are posing as adherents of Lenin's slogan; therefore, I must dissociate myself from this slogan, otherwise I may be confused with the opposition, otherwise I may be accused of "compromising with the opposition" — such is the logic of these comrades! secondly, to catch certain simpletons and to induce them to dissociate themselves from the Party slogan of self-criticism. And how do some of our comrades react to this? Instead of tearing the mask from the oppositionist tricksters and upholding the slogan of Bolshevik self-criticism, they walk into the trap, dissociate themselves from the slogan of self-criticism, dance to the tune of the opposition and . . . capitulate to it, in the mistaken belief that they are dissociating themselves from the opposition.